I've nearly completed my series of Renton public art. Stiltwalker was the one I couldn't find a couple months ago! Its head is literally in the tree. This was completed in 1984 by Ray Jensen and is in the park behind Renton Library. 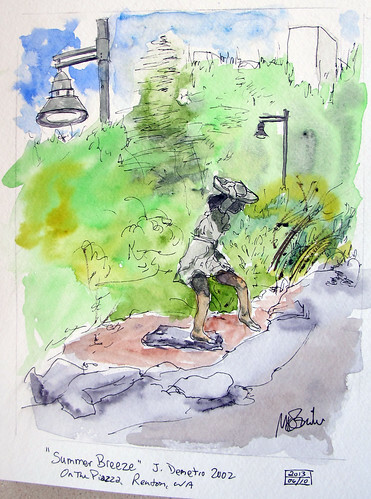 On the same day, I went to the Piazza (in the middle of downtown Renton) to sketch "Summer Breeze" It is by J. Demetro and was dedicated in 2003. 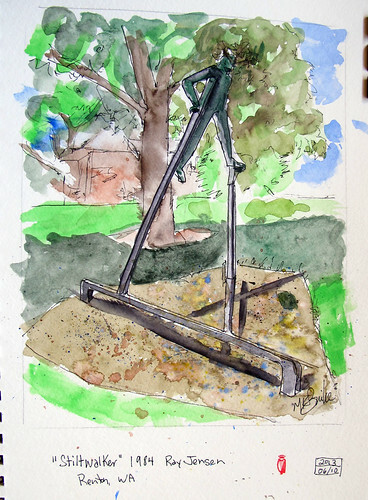 Strathmore Large watercolor Visual Journal (9x12); Daniel Smith watercolors, Lamy pen with Carbon Black ink.